Brisbane, Nov 26: Australia inched closer to taking a 1-0 lead in the Ashes series after trailing by just 56 runs chasing 170 against England on Day 4 at the Gabba here on Sunday. 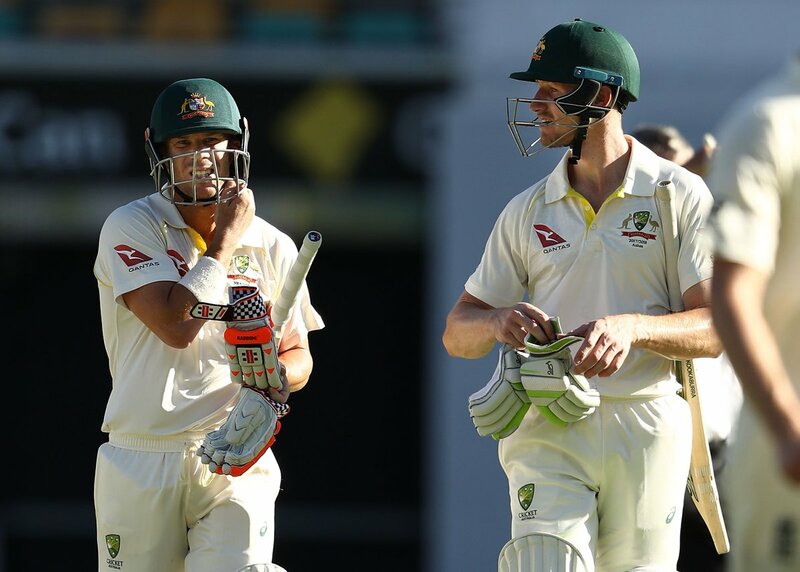 The hosts went to stumps at 114/0 after David Warner (60 not out) and Cameron Bancroft (51 not out) eased through a 34-over period to close an enthralling day. Bancroft celebrated his maiden half-century on Test debut while vice-captain Warner raised his 25th. Resuming at 33/2 with Mark Stoneman batting on 19 and captain Joe Root on 5, England failed to put up a fight as their middle order collapsed in the face of some spirited bowling by Nathan Lyon (3/67), Josh Hazlewood (3/46) and Mitchell Starc (3/51). Lyon, who picked up his 50th wicket of the calendar year on Sunday, accounted for Stoneman (27), Dawid Malan (4) and Moeen Ali (40) while Hazlewood was brilliant to get rid of the dangerous Root (51). He also sent Alastair Cook (7) and James Vince (2) back on Saturday evening to reduce the tourists to 17/2. "Obviously a great day for our team, to finish the way we did with the bat, none down with 56 runs to get," Australia paceman Starc told reporters after the day's play. The English, clearly missing all-rounder Ben Stokes, lost their final six wickets for a mere 56 runs. Moeen Ali and wicketkeeper-batsman Jonny Bairstow tried to stem the rot with a 42-run sixth wicket stand after overnight batters Stoneman and Root (45-run partnership for the third wicket) failed to get going. But Moeen Ali was beaten by Lyon and wicketkeeper Tim Paine whipped the bails off in a flash. The all-rounder's foot was planted squarely on the line and long, tortuous deliberations followed as New Zealander Chris Gaffaney pondered various angles. None of the footage showed Moeen's foot safely behind the line, so Gaffaney sent him packing. At the other end, Bairstow ramped a short outside off Starc delivery to Peter Handscomb at third man. Chris Woakes (17), Stuart Broad (2), Jake Ball (1) and James Anderson (0 not out) could not add much as England were all out for just 195 on the board. Brief scores: England first innings 302 & 195 (Joe Root 51; Nathan Lyon 3/67, Josh Hazlewood 3/46, Mitchell Starc 3/51); Australia 114/0 (Cameron Bancroft 51 batting, David Warner 60 batting).